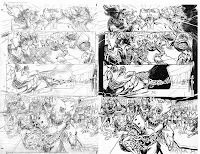 I just saw that Fear Agent inker John Lucas posted these on ComicartFans.com, and thought it was cool. He's comparing the pencils I did with his inks. John, an awesome artist in his own right, is adding so much texture and atmosphere to the inks! I love seeing his process here . Tony Moore will come in later to ink the faces, but no scans for that yet. Sorry. Dang, I too love looking at this stuff. I think it is pretty cool how Lucas went in there with a rougher edge to the inks. Not that yours are bad by any means, just a different look to your normal inks. Looking like more cross hatching and some ink splatters/dry brush going on there. For the book, I like the style because it fits the art. Thanks for sharing. Me love this stuff! I'll be posting more very soon.